Exhibiting your business in the Dream Weddings Expo is, first and foremost, an economical way to advertise your business and have direct contact with those planning their weddings as well as others planning events that are interested in your products or services. We will be marketing and reaching out to brides in Livingston, Wyoming, Ontario, Steuben, and Monroe Counties. Willow Creek Venue, a new event center now open in Lakeville, offers a beautiful space for any occasion, including weddings with separate bride and groom lounges available. With close vicinity to I-390, this is a great location for our event guests to easily make their way into the heart of Livingston County! The main ballroom features an occupancy capacity of 350 people with additional areas for vendors and guests to mingle throughout the venue. 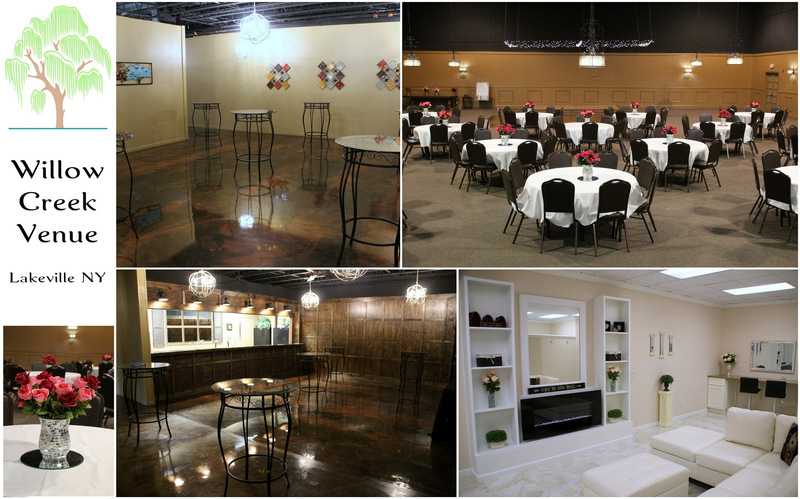 To learn more about Willow Creek Event Venue, please visit their website or follow their Facebook page. Click here to download a printable version of our Dream Wedding Expo Vendor Registration Form or complete our online registration form by clicking here. The purpose of the Dream Wedding Expo is to unite our Chamber members in the business realm of wedding services with clients seeking the perfect team to help them achieve their dream wedding! We are working to reach a broad spectrum of recently engaged couples across Western NY and the Finger Lakes region, as a whole. Our marketing efforts will include print, radio, online, and social media advertising and promotion. We strongly encourage you to also promote your participation, whether via word-of-mouth, in emails, on your website, or on your social media channels. Need Marketing & Promotional Materials? Be sure to talk with the local experts and shop IN Livingston when seeking your marketing materials! We've created the list below of our members that can give you advice and help meet your promotional needs. Adaptations and changes to the logo & graphic designs are not allowed. Please contact us directly if you are looking for a different graphic. A 6 ft table and two chairs during the Expo [and electricity, if needed]. A list of the attendees and their emails [within 1 week of the event]. The opportunity to network with other businesses in the wedding industry during the event. Access to our promotional designs for your usage leading up to and during the event. The opportunity to interact & networking with other businesses in the trade along with the ability to meet with potentially hundreds of new clients! Still contemplating joining us as a vendor? Be creative in considering how your business might benefit from this opportunity to reach an incredibly captive and motivated audience! Web Designers - Couples might be seeking someone to create a website for all the information about their big day and all the events leading up to it. Banks & Financial Advisors - Help couples launch their lives together with financial security and planning in place. Retail Businesses - Do you have items that couples might want to give to their wedding party or use as decor? Dance Studios - Can you offer 1:1 or small classes to help couples achieve the perfect first dance? Musicians & Entertainment - Are you available for wedding receptions or to accompany the ceremony? Here's your chance to fill up your 2019 & 2020 schedule! Accommodations - Help the happy couple find overnight accommodations for their family & guests so there's less for them to worry about! Salons & Spas - Who doesn't want and need some special attention before walking down the aisle? Real Estate Agencies - Be the first to capture their attention for this future need and be the person they turn to when the need for housing arrives.